CVT – What kind of concretical help has the method given to singers? The vibrations of the vocal cords produce sound. When this sound passes through the vocal tract the ‘sound colour’ is created. 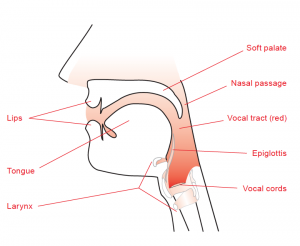 The vocal tract is made up of the whole mouth cavity from the vocal cords to the oral or nasal passages. Its form and size have great influence on the sound colour. Both men and women can have light or dark, small or large voices. All singers have different vocal tracts and therefore all have individual sound colours. Usually you can recognise a person from her/his sound colour. Everyone is subject to certain acoustic rules. If the space in the vocal tract is large, the sound will be darker; if it is small, the sound will be lighter. In other words, if the vocal tract is large, the sound colour will be darker; if it is small, the sound colour will be lighter. So a person with a wide jaw and large mouth, i.e. a large vocal tract, usually has a richer and darker sound colour than a person with a narrow face and a small mouth or in other words a small vocal tract. Try clapping with cupped hands (a large cavity) and listen to the dark sound colour. Now try clapping with flat hands (a small cavity) and listen to the light sound colour. You can always remember this acoustic rule by this test. The shape of the vocal tract can be moved in many directions so there are many ways of changing sound colour. You can change the shape of the vocal tract by changing the form and position of the epiglottic funnel, the larynx, the tongue, the mouth, the palate and the nasal passage. For clarity, I shall go over each of the elements and its respective influence on sound colour. However, the elements cannot be isolated completely because they interact with each other. For instance when the palate is raised the larynx is usually lowered and vice versa. This is an automatic reaction, but you are able to learn to separate the various elements so they can be used independently to a certain degree. A good singer is often characterised by having an even sound colour and volume regardless of pitch. For example, a trained singer will not necessarily sing more quietly on the high notes and more loudly on the low notes. Performing with even sound colour and volume is technically demanding and often requires much practice. Popular and classical music demand different sound colours. When you want to change the sound colour, you have to change the setting of the vocal tract. The vocal tract may be moved in many directions, so there are many ways of changing sound colour.